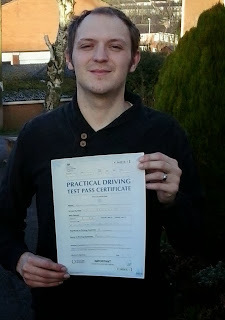 The day has finally arrived for James Mason who passed his driving test today. He did the honours at Colwick test centre here in Nottingham. It's not the first time for James. He has taken the driving test no less than six times with other instructors over the years. He's a tech minded individual and this can be a problem when learning to drive. The art of driving is very intuitive with a lot of it being done by feel. By the time you have weighed up the situation, explored all the options and second guessed yourself time has run out. Really intelligent people can tend to over think everything in driving from how to operate the controls through to dealing with the traffic situation. You've got to learn to relax and just go with it sometimes. As you become more experienced you'll find that your first gut decision will be the correct one. Getting caught in two minds can lead to some very dodgy situations. James learned to do this and has become a very smooth and competent driver. All the best mate and happy motoring to you! Why don't you learn how to drive?